We arrived in Montrose, Colorado last night after sunset, and, sick of driving, ate dinner at the restaurant across the street from our motel. This is when the internet feels like a curse. We knew in advance that the place was going to be mediocre. If we could have only mustered a little more energy, we could have had a good meal somewhere on the other side of this sprawling, suburban-feeling town. So, not only do we eat preformed, probably frozen hamburgers, we also feel like lazy asses. 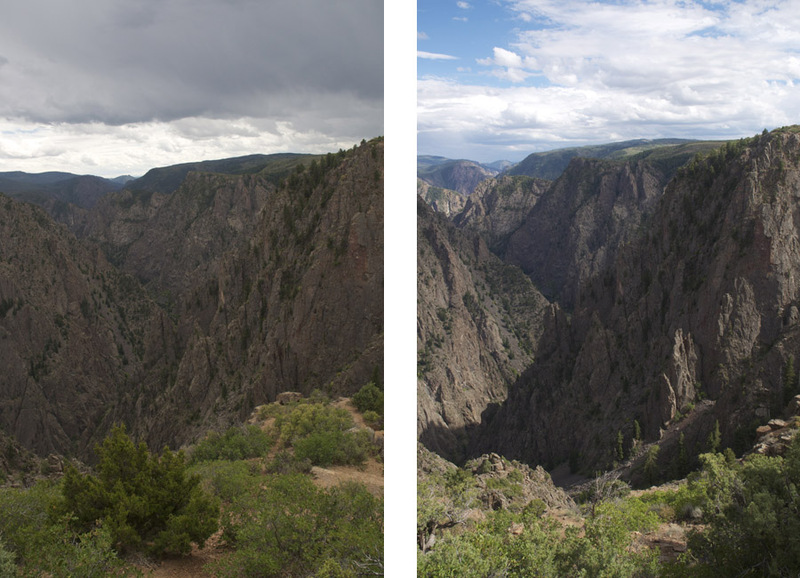 The next morning, we visit the Black Canyon of the Gunnison National Park. It is only a short drive from our funky (more on that below) motel. Unfortunately, it was overcast and the dull, uniform light made for an underwhelming viewing experience. We couldn’t get a sense of scale, or see where one outcropping ended and the next began. After we did all the vista points, the sun began to peek out, and we revisited a few spots. The difference was amazing. Very pretty, steep and fairly dramatic. Still–not black like I expected. The rock is a middle gray, shot through with pink and white veins. This is worth a visit if you happen to be in the area, but I wouldn’t plan a trip around this. 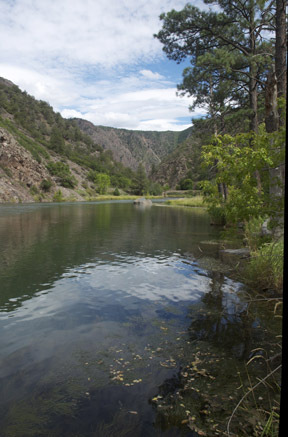 We drove down a twisty, narrow road to the canyon floor and were rewarded with a pretty river view. After that, we drove to Cimmaron, a historic narrow-gauge railroad town. How could I resist a place with a name like that? Well, Cimmaron was a town, but is now nothing more than a few old train cars and a visitor’s center that is “sometimes open” – the plaque on the wall actually says that. 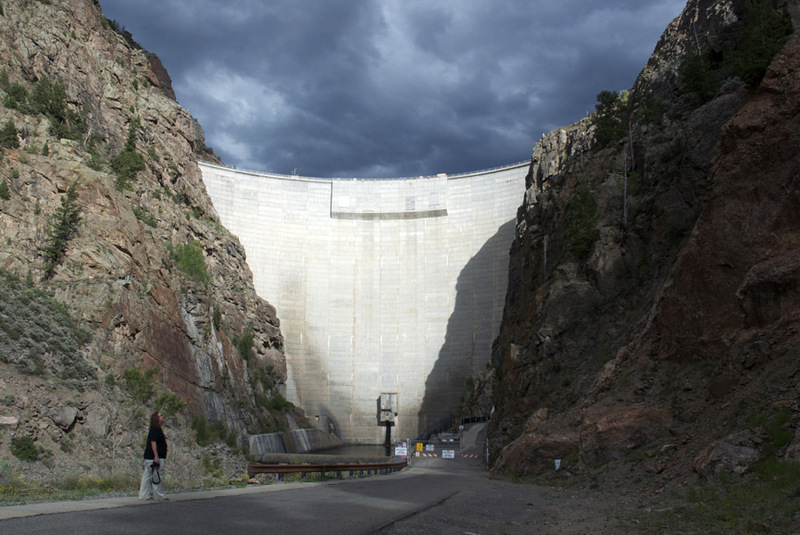 Our time was not totally wasted though, as a short drive down the road put us at the bottom of Morrow Point Dam, a dramatic slab of concrete rising in a steep sided canyon. Very cool! The rocks in this area are super sparkly (mica?) and I got a few samples. That evening at the motel I saw an ad for the Star Drive-In. I hadn’t been to the drive-in since I was a kid so we decided we had to go. I mean, why not spend more time in the car? 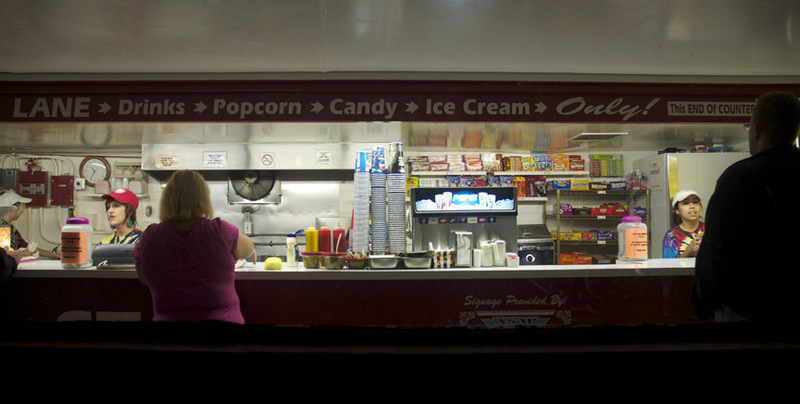 …the snack bar, all of it made me feel I was in a time warp. We stayed at a cute, mom and pop motel in Montrose. You can see our oversized rental car parked directly in front of our room. I fight an internal battle every time I have to decide whether to stay in a cute little place like this or a generic chain hotel. Here are my main pain and pleasure points. First, I need a decent bed. After a day of driving and hiking, I’m worn out. Nothing is worse than sitting down on the bed and realizing it is one of those mushy, three-inch thick mattresses that sag in the middle like my grandmother’s “one-nighter” pull-out couch. A chain hotel will generally have a decent mattress. A little place like this? It is a gamble. In this particular case, the bed was bad, and for the first time ever, R. and I ended up sleeping in separate beds (we had 2 doubles that were touted as queens) due to the roll-to-the-middle phenomena. 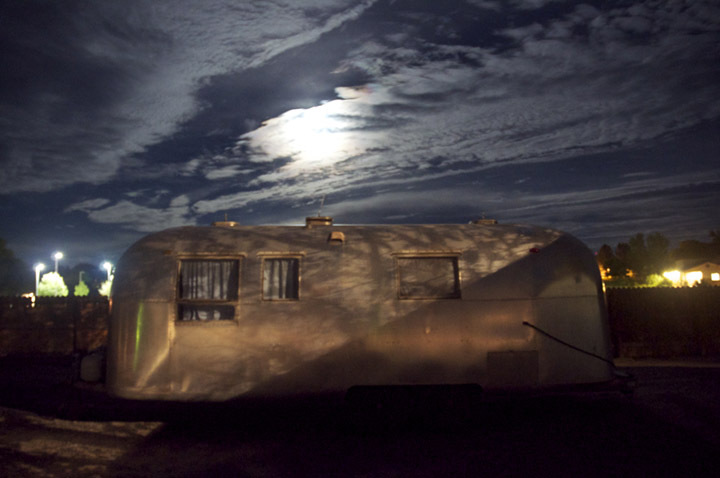 However, with the small motel you get lots of charm, character, and quirk. It means a lot to me to have a unique experience. Nothing creeps me out more than arriving in a town I’ve never visited and checking into a hotel EXACTLY like the one I left in the dust 400 miles ago. In a small motel, you won’t be greeted by a smiling woman in a uniform reciting a canned speech. No! You’ll be greeted by the owner or a live-in manager and they might be a sweet Indian guy who steps away from dinner to check you in, or it may be a skinny, shaved-head white guy in a dirty T-shirt with blood-shot eyes who really wants to tell you all about the motel and the area and a whole bunch of other stuff as you politely nod and slowly shuffle towards the door and promise you will come back to the lobby soon to get more of his great advice. Seriously, I cannot tell you what the woman at the front desk at the Richfield hotel looked like, but I could draw you a picture of the dude in Montrose and his equally-emaciated, equally-friendly mullet-headed girlfriend. And the art! We stay in a Marriott in Austin for South by Southwest and every single room has the same poster and I swear, every time I see it, a tiny piece of my soul dies. It is a picture of a rowboat in some kind of murky, scum-filled body of water. It is out of focus. Not artsy, just badly done. The worst part, the kicker, is that the horizon is not straight. Argh, I hate that poster! 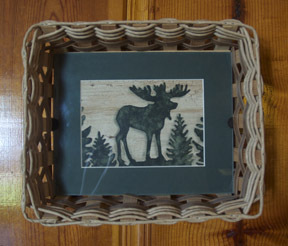 This is a signed print of a moose–in a basket! Next to this is a slice of a tree stump with a deer head inlaid in another type of wood, also signed. When you put your real metal key into the lock and turn it, you have NO idea what you will find in that room. 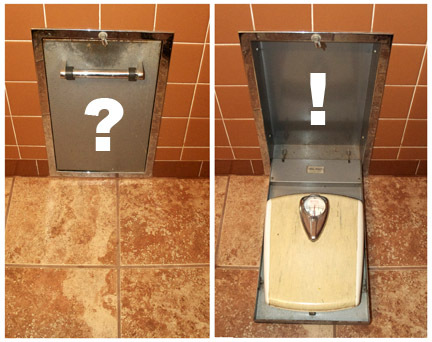 Or, how it will smell, how many holes will be in the carpet, whether or not the locks on the window work, or whether you will get more than two of the tiny, frayed bath towels. It is an adventure, and one, I’ll admit, I’m sometimes up for, and sometimes not. This entry was posted on September 2, 2012 by roadtripz. It was filed under 2012 travel, Road trip . Oh, you described the motel experience perfectly! I feel both your sense of adventure and your pain (physical and otherwise) as I read this.